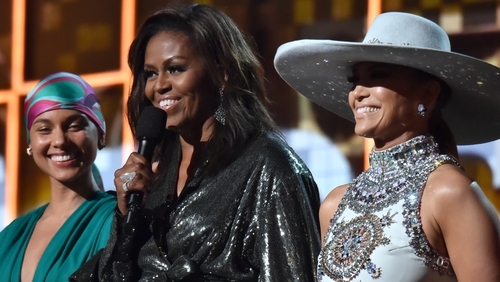 Michelle Obama received a rapturous reception when she made a surprise appearance on stage at the 2019 Grammy Awards. The former US first lady appeared alongside the ceremony's host Alicia Keys, Lady Gaga, Jennifer Lopez and Jada Pinkett-Smith. As she tried to begin her speech, which centred around her love of music and its power to unite, the crowd screamed so loudly she joked: "Alright ya'll. We have a show to do!" She continued: "From the Motown records I wore out on the south side to the "who run the world?" songs that fuelled me through this last decade, music has always helped me tell my story and I know that's true for everybody here. "Whether we like country or rap or rock, music helps us share ourselves, our dignity and sorrows, our hopes and joys. It allows us to hear one another, to invite each other in. "Music shows us that all of it matters; every story within every voice, every note within every song." "Is that right, ladies?" she then asked, to which the female stars alongside her responded: "Yes!" After the ceremony, Obama took to Twitter to say she decided to take part in the show to support her friend Alicia Keys. She wrote: "A big part of friendship is showing up for your girls-that's why I was thrilled to be there for the one and only @aliciakeys at the #GRAMMYs . "She is one of the most genuine and thoughtful people I know-there's no one better to help us all celebrate the unifying power of music!"